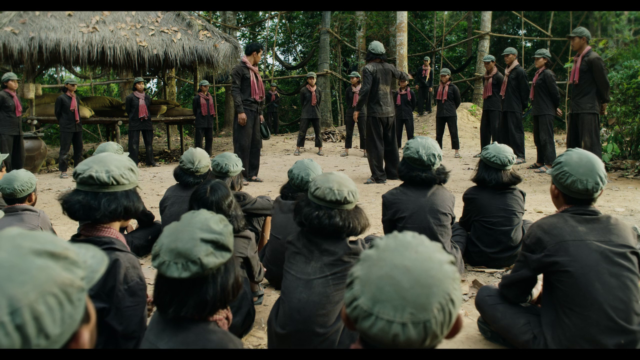 In the Western world today, the Khmer Rouge are remembered first and foremost as a Communist organisation – true enough, but simplistic enough that key components of their ideology get overlooked. Among these is their obsession with the idea that children – raised with as little education as possible to keep them ‘pure’ – should determine Cambodia’s future. Their idolisation of children not only contributed to some of the worst abuses that took place under their regime, but highlighted the problems at its core. Despite their supposed innocence, some children were considered more equal than others. Loung Ung was the daughter of a middle class family living a comfortable existence in Phnom Penh in 1975 when the Khmer Rouge came. Her father was a military policemen and that placed the family in danger, though he hid it for as long as he could. In this film she tells her story with the aid of Angelina Jolie. As director, Jolie takes a deliberately pedestrian, no frills approach. There are times when this is exactly the right decision. The film follows Loung’s mostly linear narrative, uncomplicated by political awareness (beyond brief introductory archive footage of Nixon and Kissinger expounding the US position). 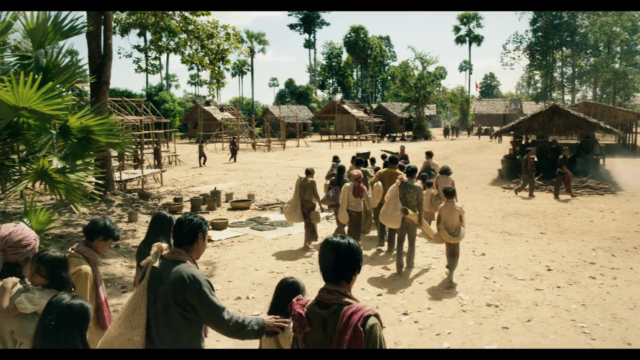 Its straightforward honesty is devastating, and it takes its place alongside The Killing Fields as one of the most important cinematic perspectives on the genocide to be made for international audiences. Much of its power stems from the performance by non-professional actress Sareum Srey Moch as Loung, who carries lengthy sequences by herself despite having very little dialogue. Extraordinarily expressive but never forced, she is utterly believable as a young child trying to adapt to confounding circumstances. Through her performance, viewers with only a limited knowledge of what happened can discover as she does. There’s a sense, early on, that this is temporary and that soon everything will return to normal. Loung’s parents encourage her to believe it. Yes, they have left the television behind, and her favourite party dresses (soon they will be ordered to dye all their clothes to rid themselves of individualism and Western vanity), but don’t worry, they’ll be back soon. 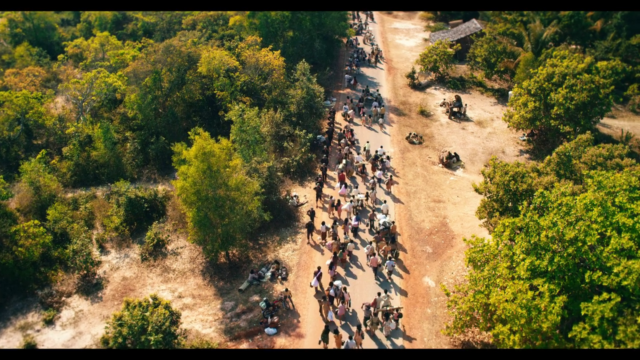 With an estimated 66 million displaced people in the world at present, there will be some watching this film for whom that experience is all too fresh and familiar. With relatives unable to save them, the family are soon sent to live in a camp and work in the fields for desperately inadequate rations. But the real horror begins when Loung’s father is identified and her mother sends her and her siblings in different directions in the hope that they can pass as orphans and find some measure of safety. Children in stories like this often have some remarkable characteristic that enables them to survive: unusual physical strength, agility or intellectual brilliance. Loung has the only one that really counts: a sturdy constitution. As other people die around her in ever increasing numbers, she manages not only to stay alive but to make in impression with her sturdiness and capacity for work. It’s a quality that leads to her being singled out for training as a soldier and, in the process, being taught skills that will later save her life. 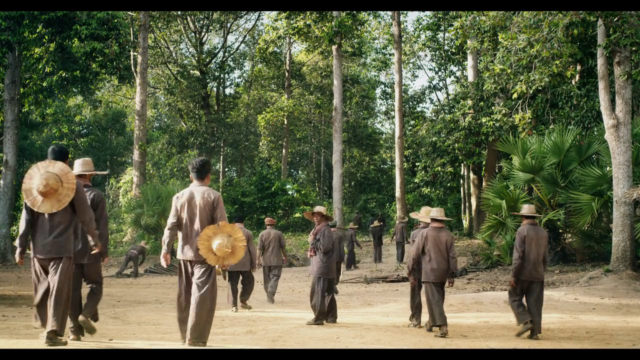 The bleakness of the story is alleviated only by Loung’s awe-inspiring resilience. There is no inspirational dynamic, no suggestion that struggle has given her a gift or even that good will triumph over evil. Though we eventually receive some degree of closure, the film’s message seems focused more on how easily a disaster like this can happen. This is brought home by the simple fact of Loung’s smallness against the sprawling chaoes around her. In one of her few directorial flourishes, Jolie carries us from intimate domestic spaces through forest clearings to gently undulating open fields where there is no escaping horror no matter where one looks – until there can be no pretence of continuing innocence.